The Tiger is in the 3rd position in the 12-year cycle of the Chinese Zodiac. Your “chinese zodiac animal is Tiger” if you are born in of these years: 1914, 1926, 1938, 1950, 1962, 1974, 1986, 1998, 2010, 2022. The following are the twelve zodiac signs: Rat, Ox, Tiger, Rabbit, Dragon, Snake, Horse, Sheep, Monkey, Rooster, Dog, Pig. The 2019 Chinese Horoscope for the Tiger zodiac sign announces that the Year of the Pig 2019 is a year of development, evolution, knowledge. In 2019, the Tiger natives will orientate towards a better lifestyle, they have plenty to learn, to understand, and to explore the more subtle area from within themselves. They can orientate towards a process of spiritual development. A very good year for your health and for the socio-professional environment in which you activate. Wood Tiger 1914, 1974 Be a better listener in your relationship ! Fire Tiger 1926, 1986 Work hard, be kind, and everything will be fine ! Metal Tiger 1950, 2010 This year find a career you love ! Earth Tiger 1938, 1998 In 2019 maintain your health and wellness ! Water Tiger 1962 It will be a year in which you will spend more time with your lover / girlfriend !waste of energy ! While you will deal with new projects, you will also face a limited resource of ideas and you will be lacking inspiration of how to further proceed. If you think of changing your job, June 2019 is the best month for doing so. Don’t be hasty and analyze all the solutions for the future before you throw yourself in a new job. Between June and November of 2019, it is best to use all your advantages and your expertise to solve and to cover any deficiency which you might carry over from last year. In the Earth Pig Year of 2019, between May and October, the Tiger natives will be forced to focus on long-term financial plans, paying attention to the incurring expenses. It is a good idea to review the financial situation and to make the necessary corrections. Deal carefully with this issue and avoid unnecessary spending. In 2019, renovation and redecoration of your own house will imply major expenses throughout the year. Also, there is a temptation of traveling abroad, which will lead to additional spending. It is time to focus on an economical option in order to stop the expenses that might exceed your budget. In the Earth Pig Year of 2019, the single natives born under the Tiger zodiac sign can enjoy the opportunities created by their new love partners all year round. They need to be wary before getting involved in a romantic relationship during this year. After the end of May, you will become emotionally stronger and you will have a better position to judge in a positive manner the future relationship. The Tiger natives will overcome the negative experiences that dominated the previous year and will move on with a great sense of intuition, in parallel with consolidating and approaching new romantic relationships in 2019. Dominant and full of romanticism and passion, the Tiger can expect a new stable sentimental relationship. The married Tiger natives will have to face a lot of challenges at the New Chinese Year 2019. It’s going to be a period dominated by a certain anxiety and even some disappointments, a period which will affect the emotional well-being of your relationship. Yet it is a good year to have a baby or even to adopt a child. The Tiger zodiac sign is compatible with the Horse and the Dog. You are compatible in all aspects. You form a good team in business and a couple worthy of envy. The Tiger natives are not going to be in good relationships with the Monkey natives. Only respect, appreciation, and trust can save your affair. 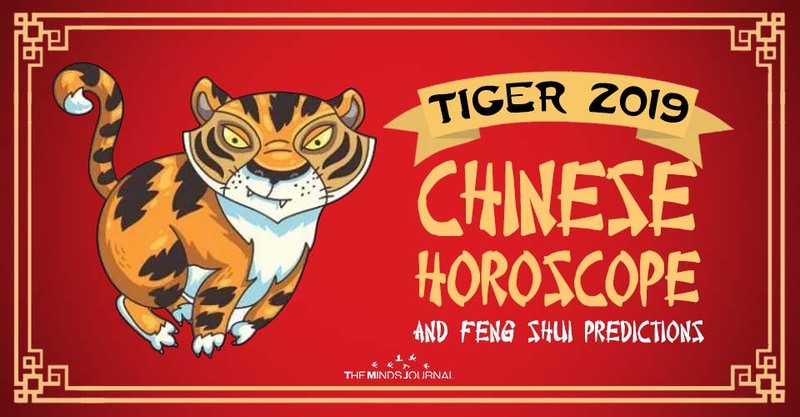 The 2019 horoscope for Tiger portends that you will be full of energy and vitality and you will mainly follow the directions on which you started at the beginning of the year. It is time to prioritize achieving your main objectives in an easy and personal way. In order to avoid any nervous breakdowns, it is best to do everything with patience, in phases and to give yourself enough time to relax. During the Earth Pig Year, the Tiger natives need periods of physical training in order to maintain a good shape and to have the capacity to recover when they go through difficult times. The emotional health can be much improved by avoiding conflicts with those around you. Your desk and your contracts can bring you prosperity and development in your professional life. You need to set them in the South-Eastern side of your home. In this sector, where the desk and all the papers you are working on are placed, you must avoid fire elements, if you don’t want to block the success in money matters. An efficient remedy in the Earth Pig Year of 2019 for the Tiger natives is the Feng Shui Painting with the Double Happiness symbol. The Symbol of Double Happiness is a very strong symbol of love, attracting harmony and passion within the couple, stimulating on a sentimental level. Health: Place a Wu Lou in the East side of the living room, so that the entire family can enjoy a good state of health. The Eastern sector is the universal place of health, according to Pa Kua life aspirations. It is particularly strong in this sector because of its wooden element. Also, we recommend you to wear in your purse, pocket or in the car a keychain or a talisman with Wu Lou that can protect you from negative energies, accidents, and bad luck.